Hi friends! I cannot believe it's been three weeks since my best friend Keri and I were cruising on the Carnival Valor. Our first night on the ship was an early night since we boarded the Valor a few hours after finishing the Walt Disney World Half Marathon. We both woke up STARVING. Luckily for us, it was a day at sea which means SEA DAY BRUNCH! Sea Day Brunch is a sit down meal that is served on days at sea. There is no additional charge (unless you want adult beverages or specialty coffees). 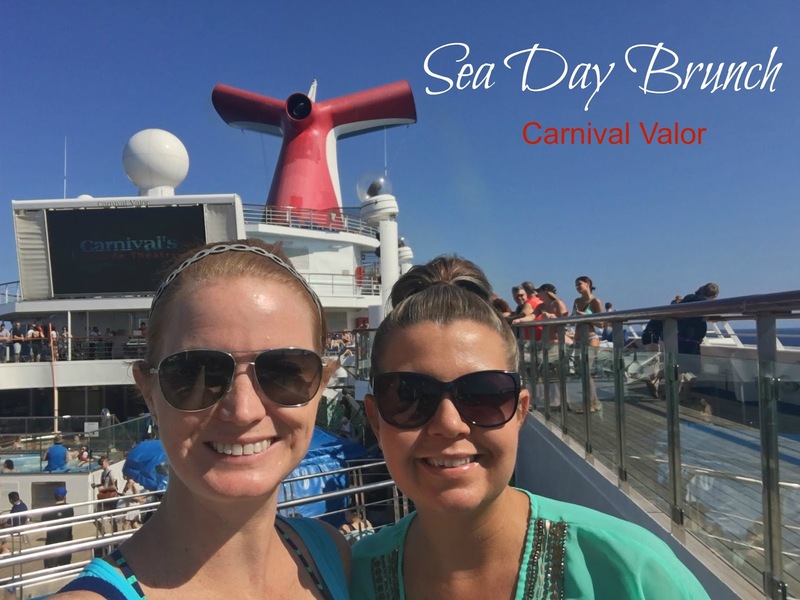 The Valor's Sea Day Brunch was located in the Washington Dining Room and both times we had brunch on the ship, we got our same servers as dinner. I've said it once and I will say it again, we loved the wait staff on the Valor. Typically, Keri and I would skip on bread service and use those calories towards extra mimosas, however the day after running 13.1 miles, we were famished. After receiving the bread service on Sea Day Brunch, we may never skip bread service again. Croissants, Pastries, Muffins...oh those muffins. We found ourselves fighting over them. When it came time for entree's, we were torn. 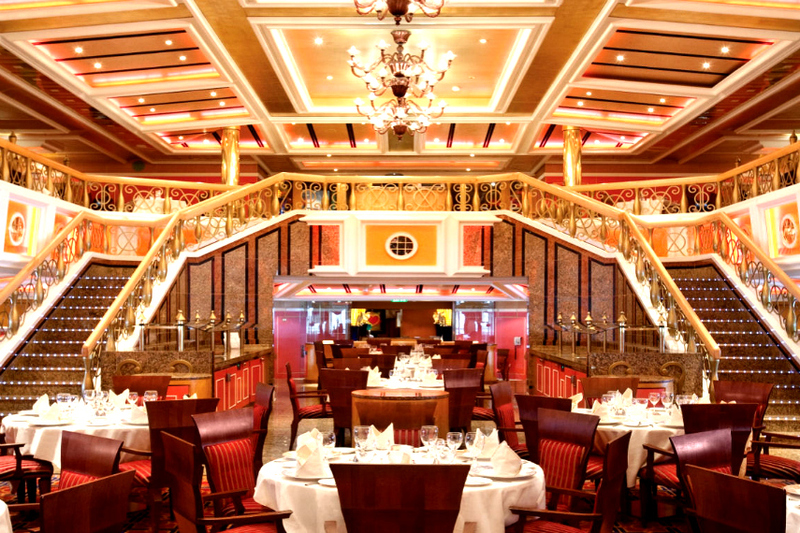 The great thing about dining on cruise ships, if you're stuck between two entree's, you can order both. No one will judge you! I started off with the steak-n-eggs, a filet mignon topped with two eggs, grilled tomato and home fries. I added sausage and french fries because I was hungry and wanted everything on the Sea Day Brunch Menu. We also got an order of chocolate chip pancakes to split. Both days we had brunch, Keri ordered the same thing, an omelet. This particular one was spinach, cheese and bacon. She also got a side of bacon and homefries. You can also request to get egg whites. Aside from Sea Day Brunch, Carnival Valor also has multiple omelet stations throughout the ship. On our second Sea Day brunch, I ordered Huevos Rancheros, two eggs (I had mine poached vs. fried) on top of chicken quesadilla, manchego cheese and multiple dipping sauces. This was my favorite Sea Day Brunch dish to date. There are many items you can choose from on Carnival's Sea Day Brunch - pork chops, eggs benedict, french toast topped with cereal (fruit loop french toast! ), fried chicken mac and cheese - you name it! Oh and we cannot leave out the beverages. We had a few going at once. Sea Day Brunch is the perfect way to start out your day at Sea. With full bellies, we headed to the pool deck to watch the Carnival Mixologist Contest, where three cruise guests compete to have a drink named after them on the entire cruise. I entered but was not selected to be one of the three. That's ok, after seeing this, I was perfectly happy not being on stage! So much fun though (PS that guy didn't win).